When we speak of writing a proposal for project, we are talking about a statement… a statement of the work that you have done. In short, the research proposal is a document that is persuasive in nature. The objectives include identifying the kind of work that needs to be done, to explain why this sort of work should be done and to persuade all your readers that the sample proposals you have made are right and equally qualified. They come with a good management plan as well as a technical approach along with all the resources that are needed in order to finish the task. You can write a good project proposal if you know how to go about it!. And this post shall definitely help. So keep reading! 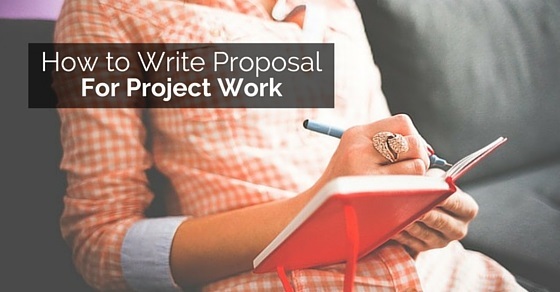 The following mentioned are few tips on how to write a project proposal. 1. So what makes a proposal good? One of the attributes to include is appearance. If you want your proposal to be good, you have to make it attractive and give it an appearance that is inviting as well as professional. Along with that, the information must be easily accessible. The second feature is substance. If you want a strong proposal, you have to make sure it has been organized very well. Plus every proposal that is strong must have all details that are technical and are needed in order to sell the project. You should also remember that the proposal must be a document that is persuasive. 2. How should you organize your proposal? In order to organize your proposal, follow some of these ideas. First of all leave the first page for the title and make sure it is written in capital letters. You should also mention the name of the company that is sponsoring you along with the name of the person who helped you along with the information. Don’t forget to mention the name of the team along with the names of the individual members. The date should also be mentioned. The picture of the product and the logo of your team must be included as well. Next comes a small summary of the proposal. You should also highlight the management as well as technical approach. Before you start the proposal, there are a couple of things that you should always remember. A project that has been planned very poorly will have very little chance of becoming successful. Also you should keep in mind that things can go incredibly wrong and that you should prepare yourself for that from before. You could run out of time and that could be a very common problem. Second, maybe your readers will not be pleased with your work or maybe it will not match up with the expectations. Third, if you use bad tools of methodology, it could go very wrong. So try to avoid these mistakes from before onwards. 4. What sort of a plan should you have in mind? Before you start planning, you should have a good idea of what a good plan is about. The first thing is context. You should know what context you are writing in. Second, mention the problem and raise the issue. Third, mention the related work and finally you should mention the solution. Also other things you should not miss out on include the aims as well as objectives. The task as well as timetable should also be included. If you mention all of these, you won’t have anything to worry about! 5. How should you write the introduction? The introduction should be one to two paragraphs. First, you will have to come up with a motivational sentence. Make sure there is some good quote that will encourage your readers to read a bit more. Second, you should make a summary of the problem in one or two sentences. You must also mention the solution in another two sentences. Also, the project proposal format along with the proposals should be written in sections. Try these steps in order to write all your project details. Different categories need different kinds! For architecture and environment, you will need two to three paragraphs tops along with the figures. First of all, you will have to describe the environment of the project along with the software, hardware, organization and languages. Don’t miss out on the diagrams as well as figures you are thinking of using. The tools that you will be using should be discussed here as well. The implementation, challenges as well as issues should be written in at least 2-3 paragraphs. Write why your project is unique and see how you are going to use the tools and systems for the problem. Also, what do you think will become the most difficult issues along with the challenges that are needed in your implementation. The deliverables shall be written in around 3-5 paragraphs. Point form shall be used in order to write the perfect description. You must first in this category write the report or the programs. Second, you should describe in details all the features of all the products of the project. Finally, you should mention all deliverables into different phases. You must also indicate all the components. Don’t forget to mention all the contributions! 4. How should you write the summary of the project? In order to write the summary of the project, you will have to take a couple of things into consideration. First of all, why do you think you are doing this project for the semester? Second, what do you think you will be doing? Third, how do you think you should go about it? Finally how long should it take you to finish the summary of the project and how much will it cost? Once you have all of these things in mind, you will be able to write a good summary of the project like a pro! 5. What are the costs of the project? In this part, you will have a good idea on how you should estimate the cost of the entire project. First of all, you should consider the budget of the project. Make sure the budget is detailed and well lined. It should be divided into different categories such as salaries and the travel. The fringe benefits and the supplies or the equipment also matter. You have to make sure it does not include any of the overhead costs which could be associated with the project in some way. Second, keep a track of the budget narrative. For those of you who don’t know what a budget narrative is; here is a definition. A budget narrative is something that consists of the needs of the commentary in order to clarify as well as justify the figures that are needed on the budget. Finally, we come to the financial statements that are additional. There are a few proposals of the project which could need a few financial statements. A profit and loss statement is also needed alongside. You must also include a good tax return, some annual reports and a good list of the resources of funding. Don’t forget to do research before you write down a proposal. It is very important to have a good idea of what you are about to write. So make sure you’ve spent enough time on research. Read enough and make a couple points if you can, before you can start writing. You should actually look up on the net for some cool and interesting ideas on how to write a good proposal. If you want to check out some great samples on how to write a proposal, make sure to go online and check the net. That should really help! There are so many great samples available online and we believe they will really help you get a good idea on how you should go about it. Apart from that, just follow the rest of the tips we have mentioned before and you are good to go! The following mentioned are few final tips to write a project proposal. Before you finally submit your project, it is very important to do some thorough research. Make sure what you are writing is clear enough. If it makes sense to you, it will definitely make sense to the others. Plus see if you have mentioned all the sources. That too is highly crucial and should never be missed out on. No matter what, always remember that what you present is an example of you. So basically you are representing yourself on the paper. Make sure it is good enough! Your project proposal should always have ideas that are smart and well written. The problem you are about to mention should be very genuine. You can try using a two step approach for this problem. Number one: you have to define the project properly with the help of an approach that is participatory in nature. Number two: after this you may adapt the proposal of the project using a donor that you have targeted earlier. Finally, you have to use a framework that is logical. This is basically a simple tool that helps you understand the project in a systematic manner. Always remember to take your time. Do not ever rush the whole thing. You could end up making some very serious mistakes in the process. It would be our advise that you take one thing at a time. Take a break if you need as project proposals are not always easy to do. They take some time and can really confuse you if you’re planning on doing it altogether. So take things slow and do as much as you can. 4. What are the things you should never do? Here is a quick list of the things you should never do while writing a proposal for a project. You should never let the problem be. Always make it a point to solve it. You don’t have to make a list of the human resources that were not used while trying to match with the outcomes. You don’t have to identify the outcomes which are not in any way corresponding with the problem. And finally, you also don’t have to identify the outcomes, especially for those things you don’t have a solution for. 5. What are the things you should pay attention to? 2: Words should always be logical and concise. 3: Do not make spelling mistakes whatsoever and finally come up with a title that is catchy.. The presentation and layout is also crucial. So use footers and proper paragraphs. Don’t make it monotonous and make sure to have a table of contents. Also when you are printing, use format paper. With that, we would like to bring the post to an end. Hopefully, you have learned how to write a project proposal. If you follow all these tips and ideas, you will surely be able to write a great proposal for your upcoming projects. In case you know someone who needs some help regarding with project proposals, share this with them. Apart from that, in case you have a couple of questions in mind or some feedback regarding the post, please post them as well. We would love to hear from you! On that note, good luck and write a great proposal!